Karis Dunway’s instincts are screaming that there is a storm brewing around Two Claws Ranch. With the odds stacking against them, she and the Clan are in a race to save the ranch. A trail ride for a family of tourists could mean a turnaround for her people, but there is a new threat coming out of the woodwork, and they will have to work together to keep the ride on track. The only problem? She and Colt are having some serious issues with their inner bears. And the timing couldn’t be worse if they tried. Colton Dorset has two goals in life. Make his mate, Karis, happy and keep her safe. But the deeper they ride into the wilderness, the more at risk she is. He’s tired of taking hits from every angle and he’s willing to risk going against his own Alpha to take matters into his own hands. Because one thing is for sure and for certain—the Peacemaker inside of him is dead, and now it’s time for the rise of the Warmaker. 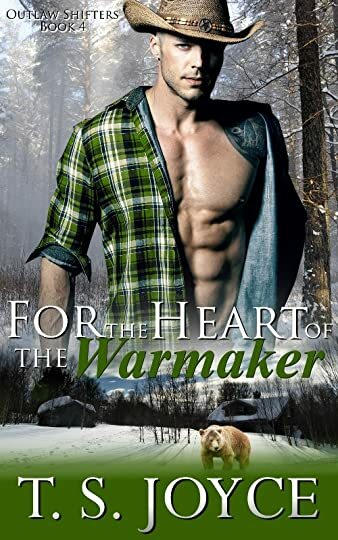 This is the fourth book in “The Outlaw” series and continues on with Colt & Karis’ story from where it left off in the last book, “For the Heart of an Outlaw”. Another satisfying and entertaining read by T.S. Joyce.